I stood between my husband and my best friend with my hands raised as Matt Maher and Zach Williams closed out their concert with a song together. Raising my hands was an act of surrender because that’s not my usual style. Sometimes I’m too distracted to give myself fully to God at that moment. Sometimes I worry too much about what others think. Sometimes I just don’t want to draw any additional attention to myself. But this time I needed to surrender and let go of all the thoughts and worries and striving. Raising my hand was a physical act of what was happening in my heart. Matt Maher has taken me into the presence of God as I’ve driven around my small town or cooked dinner in my kitchen with the usually messy floors. He’s been on my list of who I’d like to see in concert for a long time. I like Zach Williams’ music and message too. Concerts are my love language. Being at this specific concert with my husband, my oldest daughter, my best friend, and her two daughters was so good for my soul. Then twice Matt Maher had a video from Guatemala scrolling behind him. Seeing the church built on a hilltop, the children who look like ones I’ve met on other Guatemala hillsides, and the scenery that reminded me of where we were in June. The whole night was a perfect merging of people and places I love. For the past year or so, God’s really been teaching me about living rescued, which is rooted in surrender. (Here’s where I introduced RESCUED as my focus for 2018 and explained what God was teaching me.) The songs I heard at the concert really spoke into that freedom that comes because God has already established his kingdom and welcomed us in through Jesus’ sacrifice on the cross. Living rescued is about letting go and living in God’s truth rather than striving for impossible standards in our own power. burdens and be burdened for what matters. Matt Maher talked about laying down our burdens so we could be burdened for what burdens God. I have to be rescued from my selfish ways every day if I want to truly see others. I have to be rescued from my own plans if I want to be willing to go with God. I have to be rescued from all the distractions if I want to remember the truth. I walked out of the Carson Center that night feeling lighter from being in God’s presence with some of my very favorite people. I told Greg I wanted to go back to Guatemala. I told Cate I was glad I finally got to see Matt Maher in concert and enjoyed Zack Williams too. And I thanked God for rescuing me over and over again. If this idea of living rescued speaks to you, earlier this year I shared Five Practical Ways to Live Rescued. 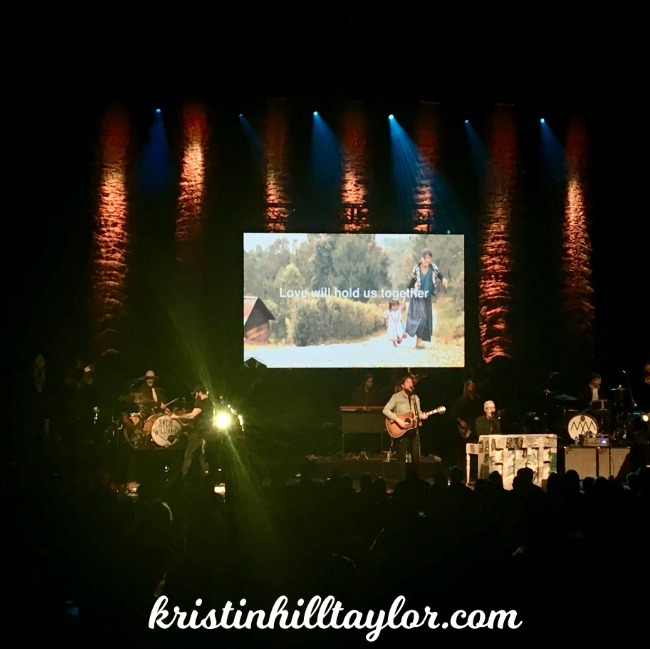 I also wrote about another concert that prompted this season in my heart of living rescued. Like concerts are my love language, so are playlists, so I have a playlist about the rescuer. Music, for some reason, allows me to be free. It lifts my spirit and allows me to respond in ways that I normally would not give myself permission to. I should listen to music more often! So glad to read about your concert experience. I hope you do get back to Guatemala. Yes, I’m the same with music. I think it just blocks out so much that’s happening around me or in my mind that I can really focus on the message and God. I hope we get back to Guatemala too. We’re thinking maybe April 2020. Thanks for being here, Laurie! I’m such an information junkie that I listen to podcasts a lot more than music, and this is something I want to do differently. Thanks for this glimpse into your life. I can lean toward information junkie too, although sometimes it overwhelms me because I feel like there are SO MANY voices telling me what to do and how to live. I actually had to take a break from most non-fiction books this year. I’m hit and miss with podcasts too, although I do like them and have my favorites I listen to regularly. I’m glad you’re here, Michele! Surrender is a word that God has been emphasizing inside of me this week. And so your post was a beautiful fit. So glad you had that sweet time or worship and release of self and stepping into unrestrained worship. It just feels right to move into those divine moments of surrender and worship. And I love that it comes in many different forms. I saw Matt Maher last month in concert with the Bible Tour! And loved every second of the truths he shared as we all worshiped together. I’m glad you got to see him too! So good! Thanks for being here, Lisa! I love surrender. Well, I love the idea of it. But sometimes it seems hard! I’m so grateful for the grace in-between my willing times of surrender!